We are part of Noosa Gallery Trail, Noosa Country Drive & the Sunshine Coast Art Gallery Trail. ​27 April 9am-1pm, the same day as the Pomona Country Markets. ​Pomona Music Festival is on the same weekend - 26, 27 & 28 April. Stallholders: Download application form here. Self taught, Christine de Stoop has been painting for over 40 years. "It seems I was born with a pencil in hand as I loved to draw and dreamed of a career in art." Christine loves life drawing, and paint in oils, acrylics and pastels. Read more about Christine's exhibition and art journey here. The Tuesday Art Group meets at Gympie Regional Gallery and consists of approximately 20 members and has been operating for over 10 years. The group is as diverse in personalities and backgrounds as is their art which feature many mediums, styles and techniques. Read more here. Do you love talking to people and want to work in a creative environment? If yes then get in contact. We are looking for volunteers to fill in shifts across the week and weekend. To sign up or ask us questions contact us now! 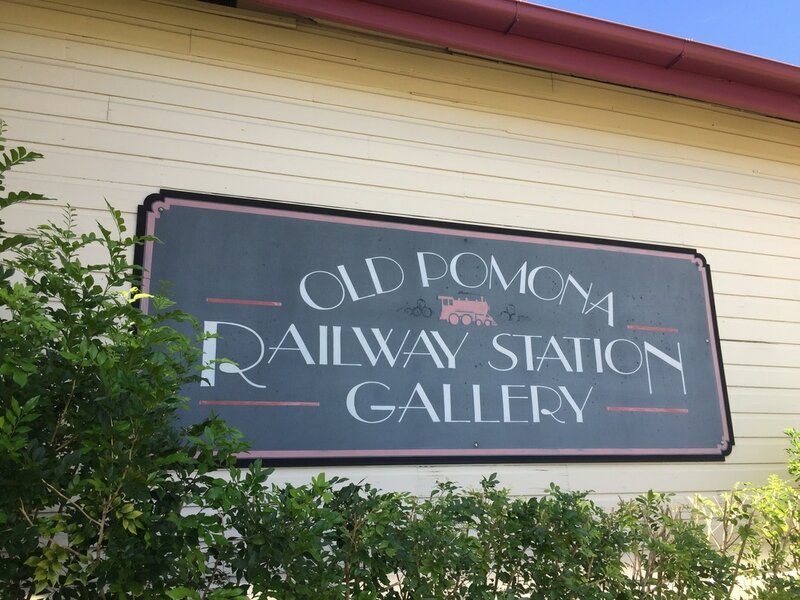 ​The Old Pomona Railway Station Gallery is located in the Noosa hinterland town of Pomona. 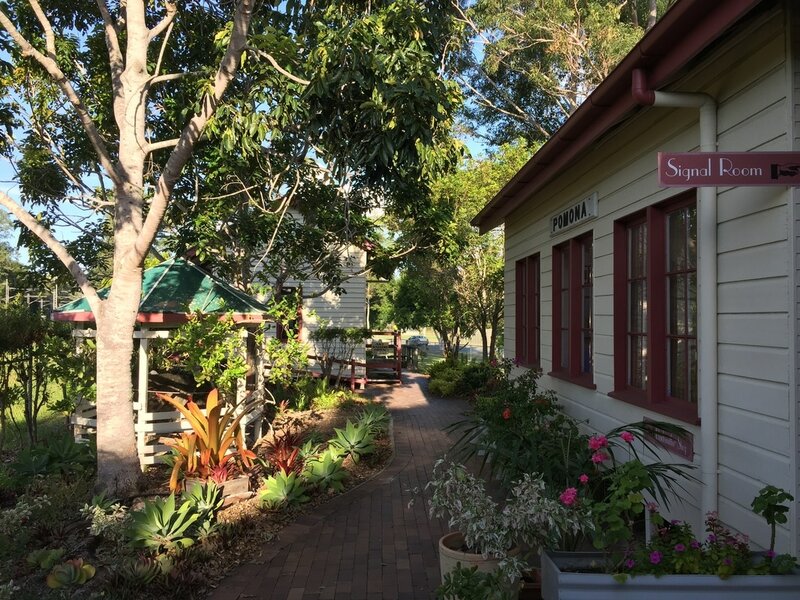 Surrounded by lush gardens with a backdrop of Mount Cooroora, the gallery is a community run space committed to serving local artists and crafts persons. 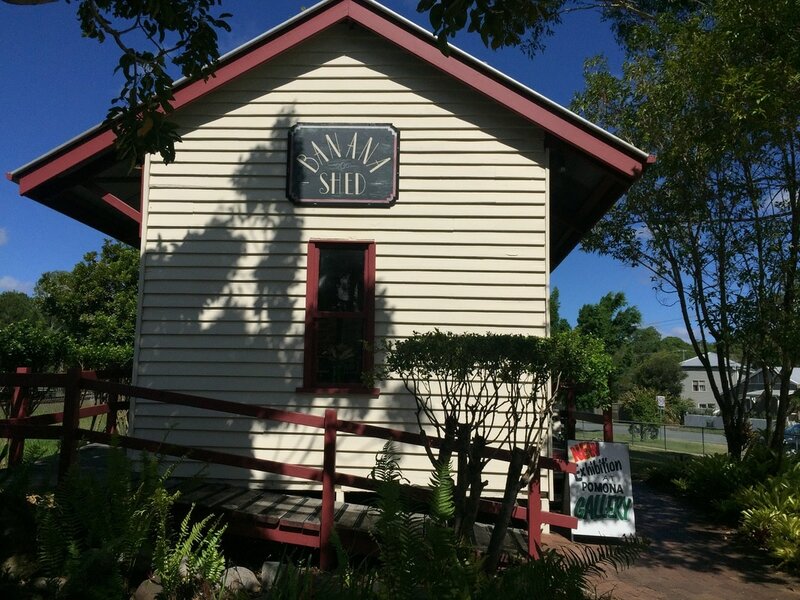 When the original railway station was scheduled to be demolished by Queensland Rail, community spirit rallied and the locals worked together to acquire the buildings, moving them from the railway line to its place now. spaces for creative art and crafts. ​a wealth of local information for tourists. The Signal Room was moved across as part of the transfer of buildings from the station to where the gallery is now. During transport the building collapsed, it was discovered that it had a termite infestation. extension – creating a much bigger space for the gallery. We use this room to display paintings, drawings and woodwork. All the art is for sale and the exhibition is refreshed every 8 weeks. ​run by the Pomona Gallery Artists and Friends Group. ​The Station Master Room is one of the original buildings from the old station. No longer a place for the Station Master, it now houses art work from local artists. ​glass work, drawings, postcards and handmade gift cards. A perfect place to find a gift for someone or be inspired to create your own art! new to see on each time you visit. The Pomona Gallery Artists and Friends manage this space and use it for theirmonthly meetings. ​Workshops are held here, as the large open interior makes it perfect for teaching and creating. Artists or craftspeople are welcome to use the Banana Shed for small workshops or gatherings. ​To hold a workshop, the fee is 15% of the total cost. ​To hold a gathering $2 per person or $15 for more than five people. A rescued rail car donated by Queensland Rail several years ago forms our Carriage Exhibition Room. Due to the efforts of locals and large cranes, the carriage was brought to the gallery property. 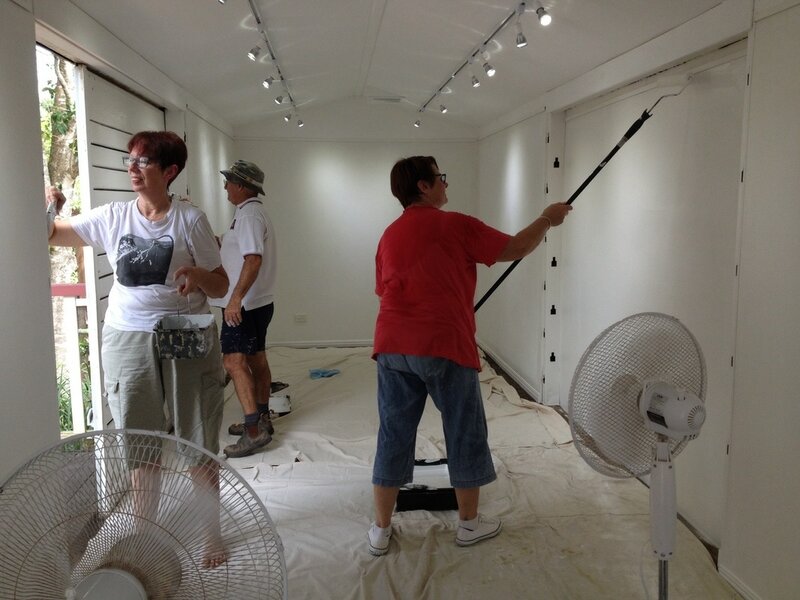 Funds were acquired through grants for transport, cleaning and fixing up to make an excellent space for art. ​craftspeople who have had solo or group exhibitions. Each exhibition has a festive opening and is on display for four weeks. ​This building is a fine replica of a slab hut, built by Jan Hubner, a dedicated volunteer from the inception of the gallery. and her Wayward Goat Design has a new home! Check out her gorgeous fabric designs on Facebook. A resident artist adds a whole new dimension for the gallery. ​​Our Information Room is stocked with detailed information and maps for visitors to the Noosa Hinterland and Sunshine Coast area. For the active person, we have maps showing where to hike, bike, or ride horses. Up to date information on cultural events, art exhibits are also available as well as accommodation brochures. Current train and bus schedules are available for those who want to travel to Brisbane or North Queensland. Volunteers are happy to share their local knowledge of the area giving visitors inside information to enhance their time here. The object of the organisation is to focus on the performing and visual arts at the Majestic Theatre, the Old Railway Station Gallery and the Pomona Country Markets; to retain the heritage values of Pomona's buildings to the highest standard, and to work in partnership with other community organisations to the betterment of Pomona and the northern Sunshine Coast hinterland. For information and membership application go HERE.